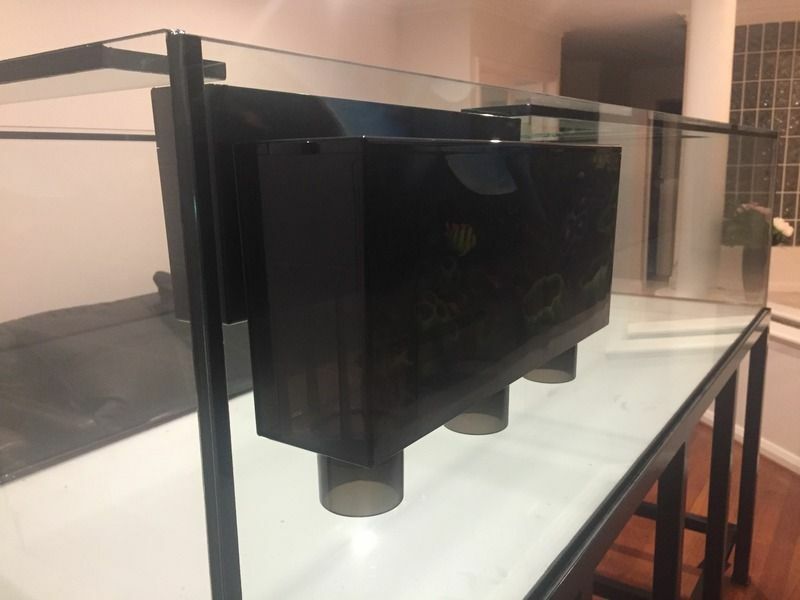 After along lay off from having a reef tank, I made the hard to decision to sell all of my freshwater stingrays and set up a new reef tank! 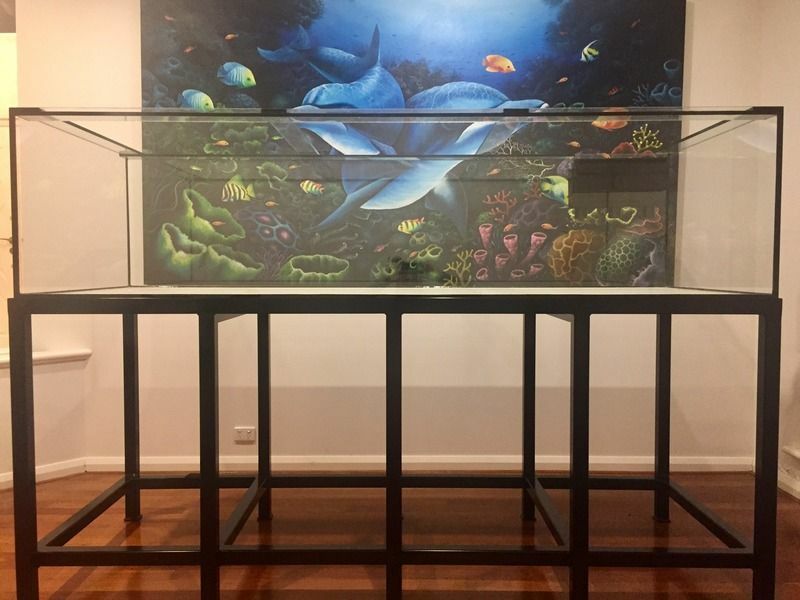 The tank is in our front lounge room that backs onto our double car garage. I picked this room of the house, as it was easy to drill through the brick wall and turn half the garage into my 'equipment' room. 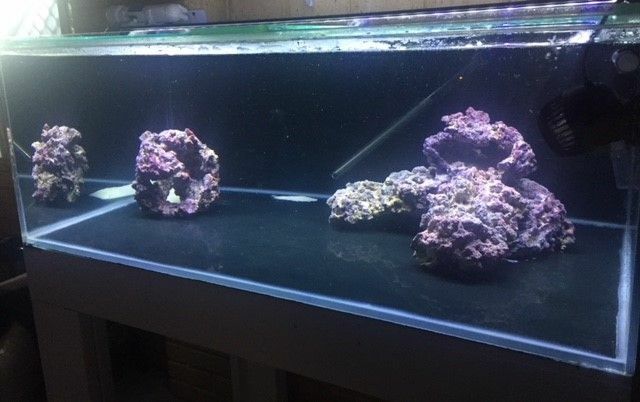 The tank itself is a 8x3x2' (LxWxH) glass, black silicone and starfire/low iron front and sides (made by Ocean Reefs). The stand I had professionally welded by a local fabricator, and powder coated 'satin' black. I picked a Satin finish (low gloss) as it gives a bit more of a 3D feel rather than matt black that very much looks 2D. I used Sheffield Metal Fabricators in Welshpool for the stand, if anyone wants a stand knocked up Adam and Sheffield is a great guy to deal with. The stand is all open and won't be cladded with anything. 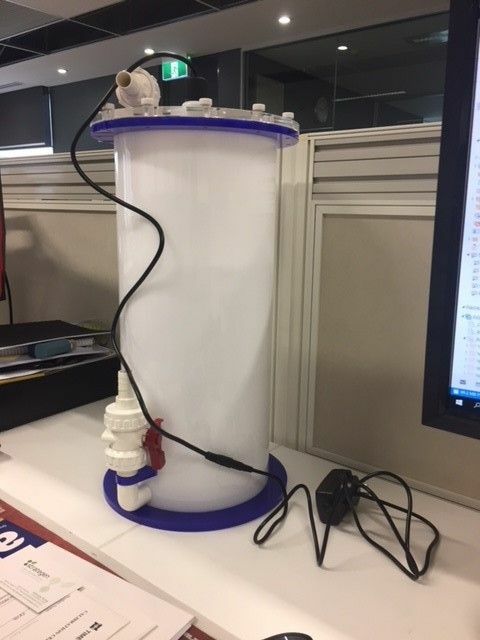 I think the height and sleekness of the stand being open gives the tank an illusion of being taller than it is at only 60cm/24". Also having a bracket made and finished the same as the stand that will go over the tank for the lighting to hang from. The tank was also drilled for a Synergy Ghost Overflow, and has been plumbed as a bean animal system to reduce noise as much as possible. 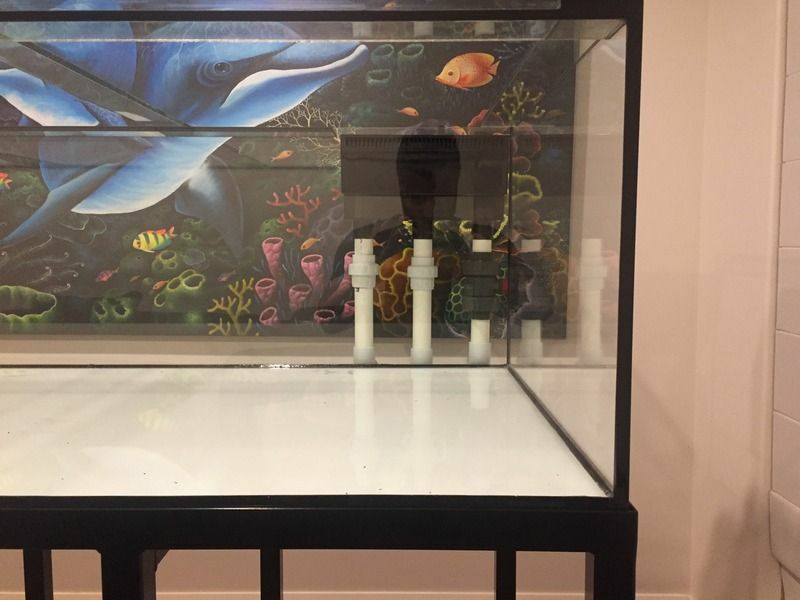 The idea is that no plumbing will be seen from the front when viewing the tank and the pipe work will go through the wall and all that will be seen is an open stand with the wall and back of the tank also painted black. 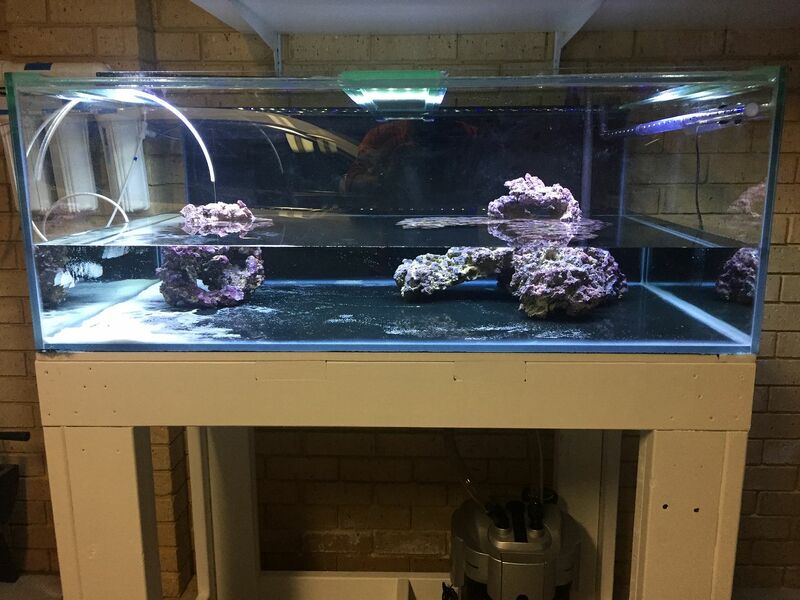 The idea is to black everything out; back glass, stand and wall and try get as much focus on the colours of the fish and corals. The quarantine tank also sits in the garage in the equipment room. The QT tank is bigger than what most people would use, but I had it from one of my FW set ups and the tank was pretty much brand new. 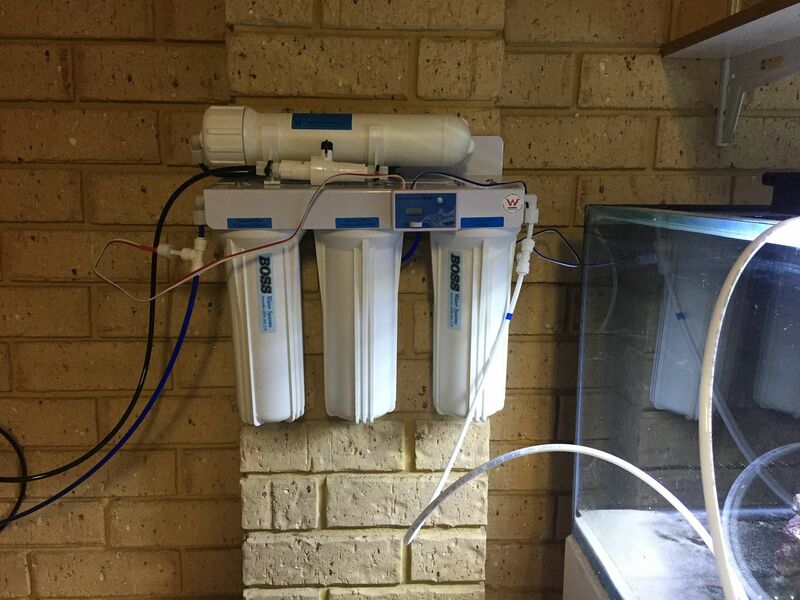 QT is 4'x2.5'x1.5' approx' 400L/100Gal - and will be filters by an Aqua One Nautilus 2700. I also like the idea of being able to quarantine decent amounts of fish at a time. The rock in the display is Carib Sea Life Rock, a combination of 'shelf' and 'shapes'. Ordered online to try it out and see if I'd use it on the display. 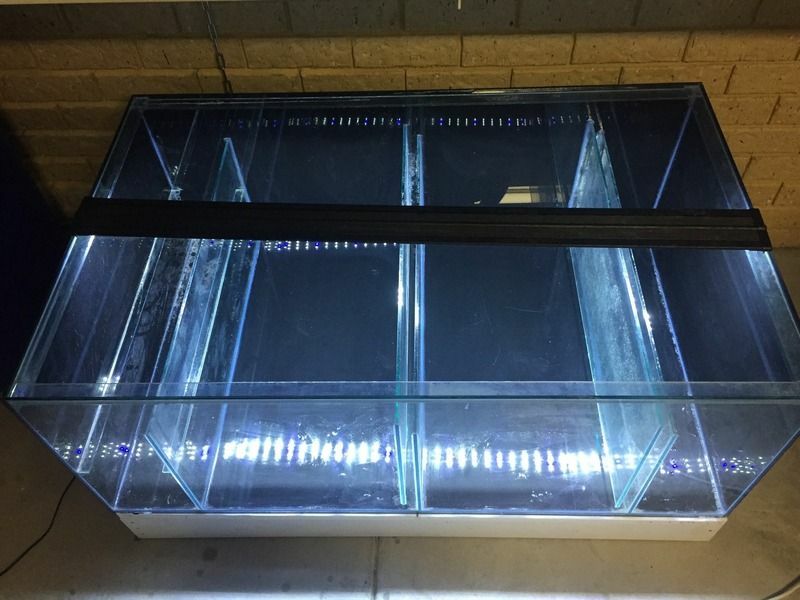 Sump - 4'x2.5'x1.5' and is approx' 400L/100Gal. 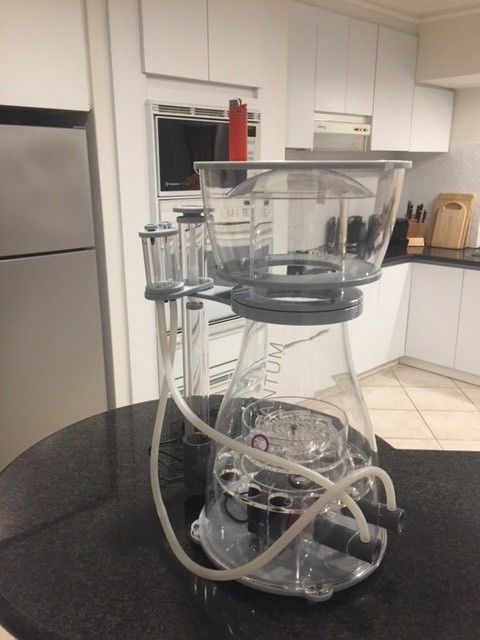 I have already bought my skimmer, ended up going with the Nyos Quantum 300. I got this skimmer as it had some very good reviews, came recommended and seemed to be reasonable value for money. I will keep this thread updated as things, change and things should come along pretty quickly. Next up is to get the back of the tank painted and the wall drilled and painted to get the tank moved back onto the wall! Edited by Peckoltia, 27 May 2018 - 11:10 AM. Jules - thanks mate. Been quite a long time in the making, good to start seeing some progress. Attached the RODI system to the wall. This RODI system has a duel inbuilt TDS meter (TDS of pretreated and treated water), actually surprised to see the TDS of my tap water around the 400ppm mark. The treated water coming out is at 0ppm, so working nicely. Still need to fix the tubing to the wall to make it a bit neater. I have started filling the QT tank with RODI, then it's time to add salt and start the cycle. 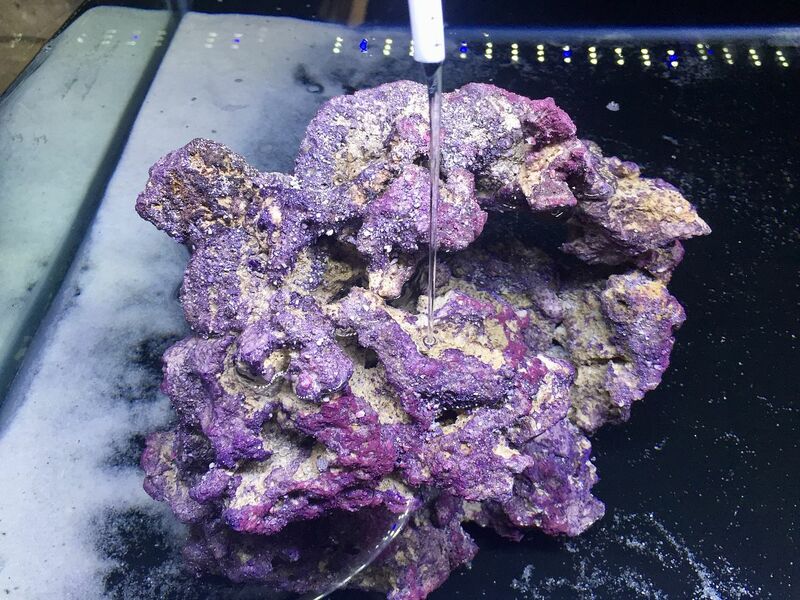 I am quite impressed with how the Carib Sea Life Rock looks when wet under lights. 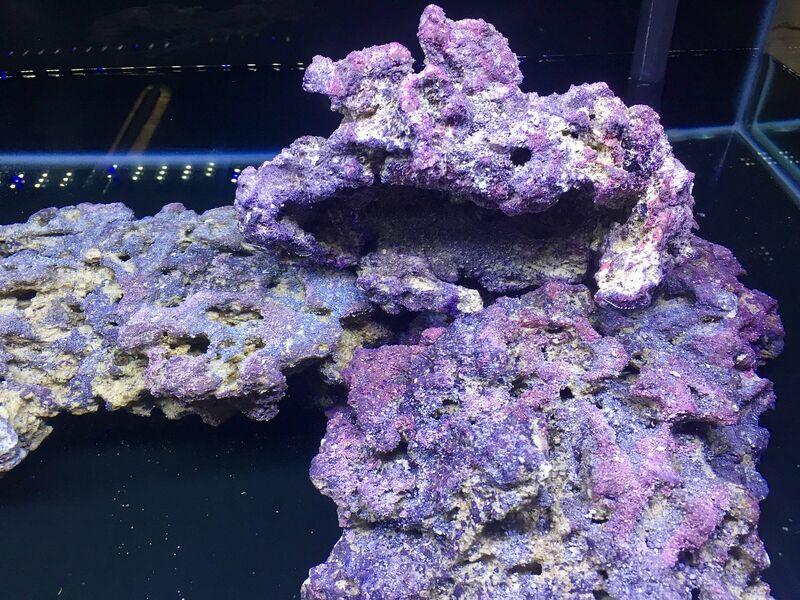 Some nice purple/pink without being over powering, I think Carib Sea have done a great job with the finish of this rock. Edited by Peckoltia, 28 May 2018 - 08:42 AM. Looking good! Nice to see another build thread. Out of interest - is it on wooden flooring? Been looking at houses. Yes, it is wooden flooring. This is the first time I have ever set up a tank on wooden flooring and will need to be diligent with cleaning up any spills. It is also part of the reason i went a bean animal overflow, that extra pipe for redundancy gives me at least some assurance that I am not going to flood the house. With the wooden flooring something to consider is what kind of wood is used - laminate, engineered or hardwood? Mine are hardwood ('Black But') and varnished which gives some level of protection. 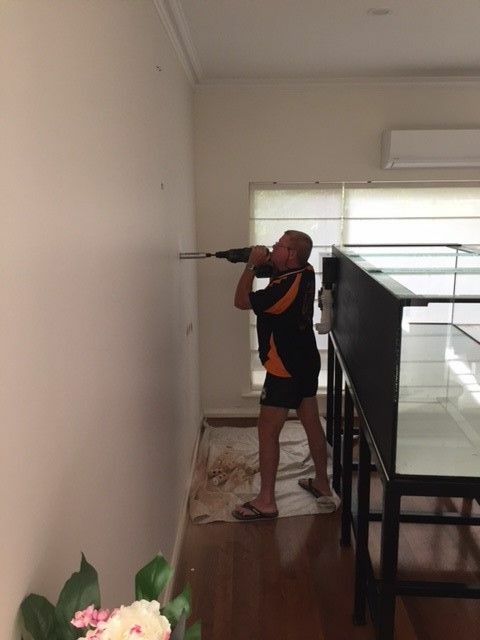 Not sure if I'd set up a tank on laminate or engineered wood, as they are a lot less resilient to water damage. Also to be considered is - how are the boards installed? This is on the ground floor of the house, and have been laid on the slab. There are generally two ways of installing on a slab either on battens or on marine ply base. Battens are exactly as it sounds battens that run under the floor boards and suspend the floorboards off the concrete. Batten installed floorboards will have a bit of a hollow sound to them like the 'old school' homes when walked on, and be 'springy/more forgiving' underfoot. My floorboards have been laid on a base of plywood so there is no void under the boards. Again, not sure I'd have a tank this size on batten installed floorboards, unless I could be certain where the battens have been laid and design my stand to have the legs resting on the battens. So in my case, I have hardwood floors installed on plywood, which is my opinion/research is the ideal situation. I also had the stand made with 10 legs rather than 8 like my previous 8' stand. Just to try spread the load a little bit more again. I considered running a length of metal along the floor instead of having individual legs of the stand (if that makes sense), but figured it'd just end up as a good place to have water trapped and ruin my floors. i am also considering running a bead of black silicone around each leg on the boards to avoid any water getting in. Quarantine cycling - will add some bacteria in a bottle in the next couple of days to speed the process up. Hopefully get the display painted this weekend and the mixing station plumbed. Seems like every week there are multiple packages arriving in the mail, which is like the adults version of Christmas! 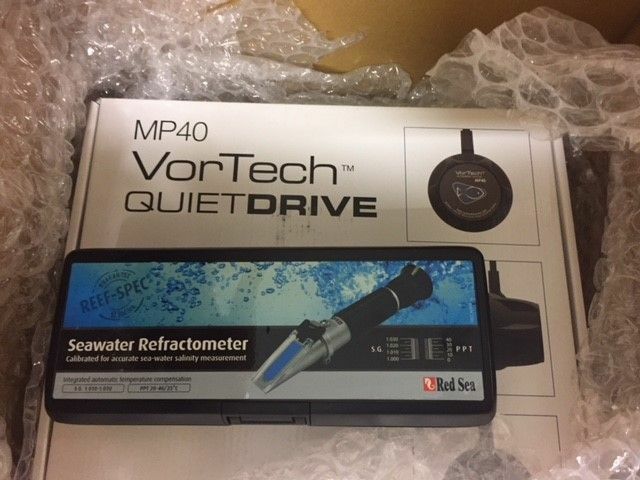 The postman brought me a new Red Sea Refractometer and another Ecotech MP40. Did get some bad news today though, the ETA on my skimmer has been pushed back to the 18th of June which is a bit of a bummer, but it does give me a chance to really pull my finger out and get all the odd jobs done. Mike - lights are the last piece of the puzzle. Either going with the Illumagic Blaze X series or Ecotech Radion Gen 4 pro's. Update - got the mixing station mostly plumbed. All dry fitted then glued. Only a couple very minor leaks which I have since rectified. Pretty happy with it and seems to be working a treat so far. The left barrel is SW and the right RODI. 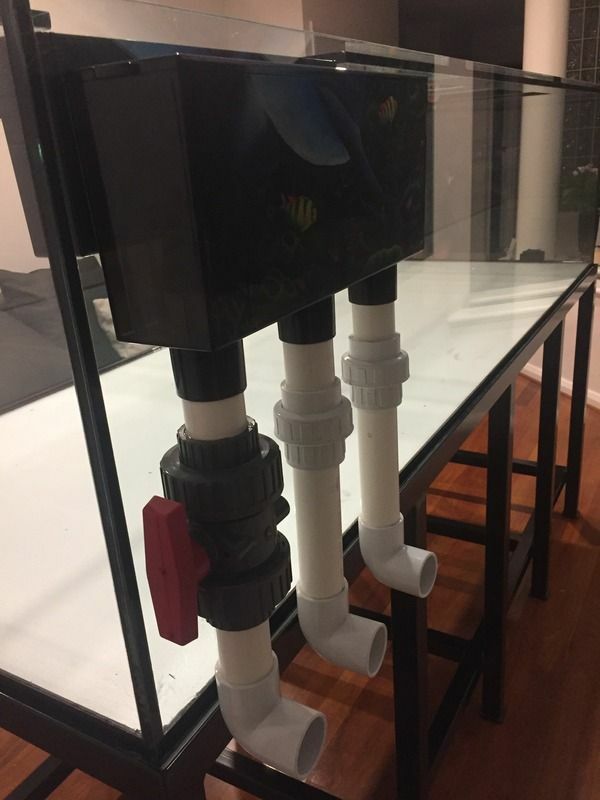 I like the 'closed loop' on the left as I can turn the pump on and really churn the water to either mix salt or get the water full of oxygen before a water change. 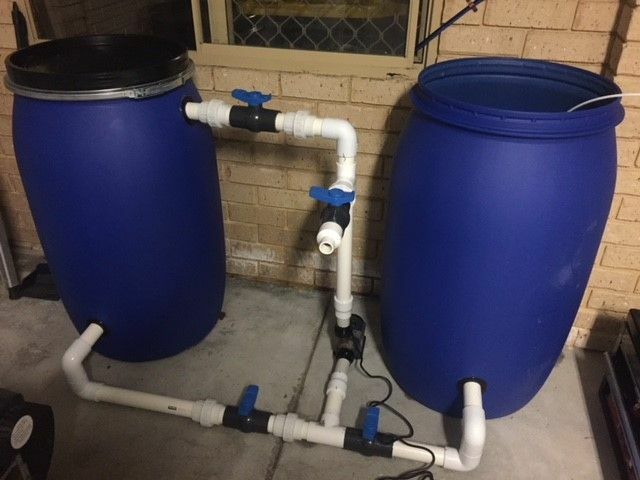 Each drum holds 220L (~60gal). All that is left to do is clamp a flexible hose on the reducer and install drill a hole for the float switch to plumb the RODI line into so I don't flood my garage. 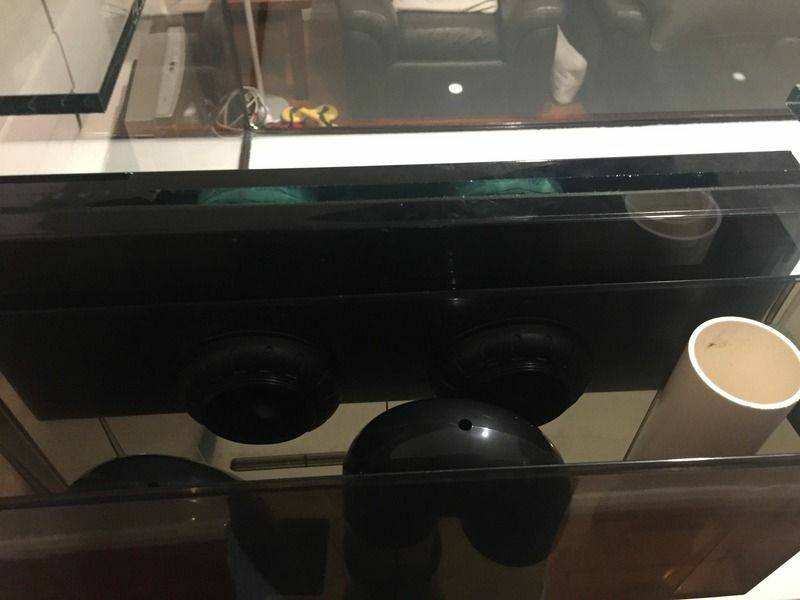 The level of this build Alex is very impressive, nothing better then seeing quality set ups! Cant wait to see it up and running man. Thanks for the kind words Jules - I crowed a bit early and have a leak in one of the glued joins which is a bit of a pain. Only a very slow leak, so will fix it once i empty the barrel on a water change in the next week or so. The quarantine tank is now almost fully cycled, so may see the first fish move in this weekend or at the latest next! Which is exciting seeing as the time and money that I have spent. Be nice to actually have a fish to show for it! Achilles Tang is definitely on the list - the Tangs/Surgeon fish will probably be one of the last 'waves' of fish to reach the display. I saw some Sohal Tangs at Vebas on the weekend, don't know if I have the stomach for one though, as beautiful as they are they have reputation for brutality, especially among other tangs. First batch of fish will be nothing exciting, the bread and butter sort of stuff; clowns, cardinals, fire fish etc. Agreed, sohal and chevron tangs, both gorgeous, grow large and agro with co-pecifics. I cant wait to see some fish going in. Finally some more progress - getting the wall drilled was a major headache, with my usual avenues unable to help me for the foreseeable future. Ended up getting one of my dads mates to help out, and must say he did a fantastic job with the 4 holes through a double brick wall - nice and straight and hardly a chip out of the plaster or the garage brick wall! really neat job. This was really holding me up. The electrician is also at my house as I type this doing some jobs including doing all the wiring of the powerboards in the garage for all the equipment for the QT tank and sump/display! So some jobs are getting done. Wall will finally be painted this week also. Once that's done things will start coming together very quickly! 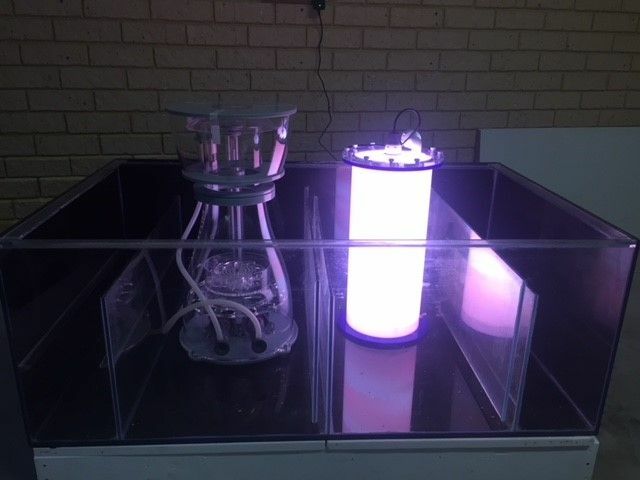 On a side note my algae reactor arrived today, got an ITC ALR 3 - I must say it is bigger than I was expecting. Seems to be well made too. Also got a call from the delivery company my skimmer will finally be delivered today too! So things are starting to move quickly now! Great to see the progress - massive job! Thanks Delapool - the effort to get this thing off the ground has been immense so far. Almost there! My skimmer finally arrived yesterday, after a very long wait. 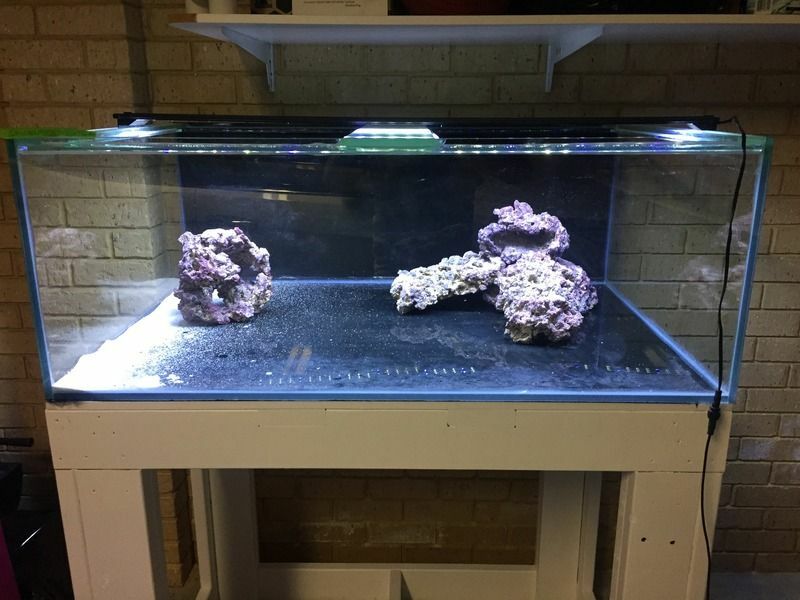 Ended up going with a Nyos Quantum 300 - beast of a skimmer, first thing I noticed was the sheer size and had me second guessing if i measured incorrectly and have it not fit in the sump! (full size lighter on top of the cup for a size reference) I must say, putting it together it feels very well made, solid and precise construction with no play in the pieces once put together. Really easy to assemble, took me all of 5 minutes with a flat head screw driver. Fits in the sump nicely, and looks the part next to the algae reactor. I turned the light on the algae reactor for a pic for no other reason than it looked awesome! I'm still undecided whether I will run the algae reactor in the sump or having it external as it does take up a lot of room in the sump. Crikey, looks like something out of the Tardis - looks nice. Yeah it's certainly not what most people have sitting in there garage, so far have been told by family and friends that I am either setting up a drug lab or a mad science experiment.